As the sun set Friday evening, the normally dark and dingy area under the Soquel Ave. bridge was buzzing with excitement. The fans in the projector were spinning away, the concrete wall finally glowing a bright blue, and I thought to myself: "This is why I live here. This is amazing and I can't see how anyone could argue otherwise." It was a special event for Guerilla Drive-In as we were showing the work of a local film maker, Cheri Lovedog. "The Jesus Factor" was shot in Santa Cruz and was created with a cast and crew mostly made up of locals, some of whom were sitting in portable lawn chairs waiting to see the most recently cut and mastered version of the film. Clay, the film's editor, grinned as it seemed that we had gotten past the final technical hurdle for the evening and the film would begin just as the sun was announcing that it was the proper time for an outdoor film. This was only part of the reason why this particular Guerilla Drive-In was feeling especially positive and community-oriented. Upon arriving to the location, many of us discovered that the area had been badly littered with plastic bags, dirty and unwanted clothing, and containers of partially eaten food. It was clear that the area under the bridge hadn't received much attention lately. As a few of us started gathering some of this trash, I was amused by the thought that we would leave this river-side space looking that much better after filling it for the evening. Finding a source of power for all the equipment also tends to be a challenge at this location. Thankfully, some neighbors (who were having a dinner party and wouldn't even be able to come down to see the showing) offered to provide a power outlet from their home. They had heard and read about the Guerilla Drive-In project and were glad to help. Another person who arrived to see the film retrieved an extension cable from his car as soon as it became clear that the sum of all our extension cables would be unable to reach the location of the projector. Other audience members offered flashlights to help locate equipment and even batteries to power the remote control needed for the dvd player. Another audience member brought a large grocery bag full of popcorn and was passing it around to share with the entire group. It felt so much like it was a community effort not only to create this film but now, also to share it with others and transform this space under the bridge into an event-- and into something better. Within the first 15 minutes of the film, this evening we had created came to an abrupt halt as an officer from the Santa Cruz police department descended on the group. He demanded to speak with 'the person in charge'. I immediately think, "Does he mean the person who is putting this event on? ...because I think all 40-50 of us did." He then asked if we had obtained a permit for the event, which we did not. He then made claims that a sound complaint had been made and we were going to have to shut down the film immediately. When further probed regarding this, the officer explained that even without any sort of sound complaint he would be shutting down the event because we did not have a permit and we were in an area that is off-limits after sunset. The officer then walked back to his patrol car and watched as we announced to the group that we were going to have to shut down the film and potentially restart somewhere else. As we were discussing the locations at which we could possibly continue the event, the officer began to walk back down to the area under the bridge. He wanted to verify that we were in fact leaving-- as if to say that we were taking too long to discuss how we might go about salvaging our evening. Guerilla Drive-In has transformed dark and unused spaces into safe and warm community events for 8 years. 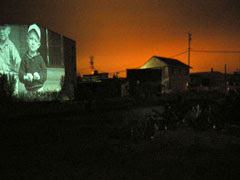 After 150 free films to the community, Guerilla Drive-In is being targeted by the Santa Cruz Police. There is an obvious crackdown underway on all DIY activities in public spaces. This is the second time in two weeks that the authorities have been directed to shutdown our showings. We need a community response to this madness. This is the community’s response to the violence on the May 3rd. Most people think that the Police response is due to the damage done to the business down town, but let me give you a different take. Several of my friends are young women who work downtown and were getting ready to go home when what they describe as “an angry mob with torches like something out of a Frankenstein movie” came down the street smashing windows and art work with tire irons. They saw some local guys try to stop the stupidity only to get jumped by five or six people and beat down. With no police in sight, they were honestly in fear for their lives. What may have only been a handful of jerks, in a relatively peaceful group gave the appearance of a crowd out of control. Even the person who filmed the now infamous YouTube video has said that he stopped because he was feeling threatened by the crowd (that he was part of). Just imagine that you were a nineteen year old young lady who has just finished working your shift at your barely above minimum wage job and as your about to walk out the door on to Front Street you see an angry mob with torches and tire iron smashing windows and beating people up. Do you think that you would be shaken up ? When people in the DIY/anarchist community chose to not speak out against violence, people began to feel that we were supporting this asinine behavior. Many of the people who saw what happened from the outside felt that something needed to be done to keep them safe. The locals who own business downtown did what any of us would do if our stuff was being threatened or destroyed – they turned to the people we pay to protect us and demanded that they earn their keep. The SCPD’s response is a crackdown on all unpermitted events as a starting point to try and prevent this from happening again. I have been part of and thoroughly enjoyed both the DIY New Year’s Eve parade and the Guerilla Drive as things that highlighted our community coming together to fill gaps in our society. These are some of the most positive, cool, and “Santa Cruzan” events that I have witnessed in the thirty years I have enjoyed in this town. And I wished that some people in our community had done something to prevent the violence that took place during the May Day stupidity or at least spoke out against violence afterward. But we didn’t - so other members of the larger Santa Cruz community demanded that the police step in and take action. This is our fault – if we had take done it ourselves (we are a DIY community after all) or even spoke out against what happened, I think the response would have been different. At least it would be more difficult to lump us in with the stupid punks who thought that smashing windows, beating up people, and threatening others in our city was a cool way to have fun. Now I’m not defending the SCPD’s response. Over the years we have watched them try to find ways to shutdown these events and they have made no secret about their desire to stop us. Do we really need to make it easier for them ? Why can’t we police ourselves?